So I have been very focused on a more comic book styled art of late. Actually been really studying and practicing for the past few years but as I have been quietly working on my own comic, I have been really falling in love with it. Mind you, I am talking about an older style of inking with a pretty heavy Kirby influence. Lots of graphic shapes! I then started to wonder if I could do a more realistic drawing with an comic book ink aesthetic. Here is a my first go at this. Came out better than I thought it would but I think I can push this further. I've always been a big fan of classic comedy. So several years ago when I was asked to paint a comic cover for the Three Stooges, I thought that other classic duo's would be fun as well. I don't know what made me pick Laurel and Hardy but I did and it was challenging but fun. For a bit. I lost interest and the drawing was incomplete when I put it on the shelf. 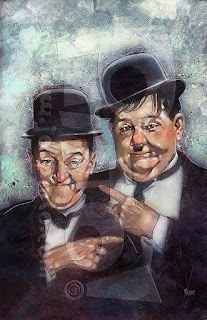 Then, I got an email and was asked if I had any Laurel and Hardy art. I replied that I did and then I found the file and finished it that same night on my iPad while watching TV even! Times change fast I guess. 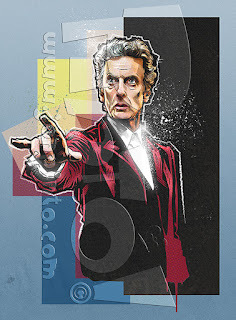 I was very pleased with the results but I never heard back about the original inquiry about having the art. 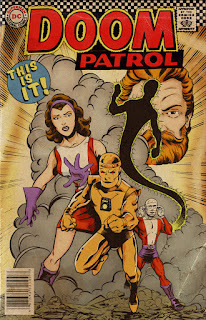 I have been a fan of the Doom Patrol for ages!! I first discovered them way back in the 70's when DC tried to revive them as the New Doom Patrol and then I got hooked when the New Teen Titans quickly became my favorite book in the early 80's. I started collecting the original issues when nobody cared about them and I could find decent copies for very little money. Now they are getting a TV show on the new DC streaming network! So while I was sitting idle at a show several months ago, I began to doodle a Doom Patrol pic. Mostly because everyone else was drawing around me and I felt a bit of pressure to do so as well. Ha! I didn't quite finish the drawing but I did scan in what I had and then finished it digitally and then colored it as well and added the dressing. Was fun. I had surgery in mid December last year and while I was laid up in bed, I watched a LOT of Star Trek! It just seemed to hit me for some reason and I watched it all the time. Classic, Next Gen, Wrath of Kahn and all three of the Kelvin timeline movies with Chris Pine and all. 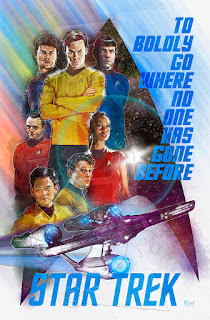 I know that Trek has become more and more polarized in recent years starting with these movies and more recently with Discovery, but I enjoy them all. I didn't really plan on doing a full poster of this but I doodled a design that I liked and just kept going. I'm pretty pleased with the results too. I don't do many white backgrounds. 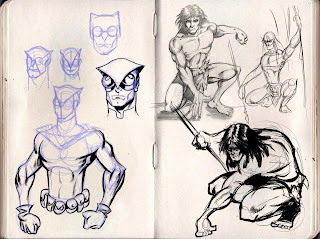 More pages from my sketchbook. Never seem to be satisfied. The struggle is real! !